Frenchie seems to be a popular restaurant amongst travellers. My cousin, who is a French native, has never even heard of this restaurant but she was willing to give this place a try (or maybe I dragged her with me). Upon arrival, I realized this place was super small, with maybe only 20 seats. Across the way is their bar and their take away "Frenchie To Go." MY FAVORITE DISH. AMUSE BOUCHE: Bacon Popover. This was amazing. I realize that it simply is an amuse bouche, but it just happened to be my favorite dish of the night. It was sweet, salty with a great texture. The bacon was subtle and wasn't overpowering. The popover had maple syrup as well. It's basically breakfast in a bite! AMUSE BOUCHE: Radish with Butter. This was a good dish. The radish was fresh with a nice crunch. The butter added a creamy texture. COURSE ONE: FOIE GRAS. I was super excited to get this dish. I couldn't wait to try the foie gras. The foie gras was cooked in grapes and melon. 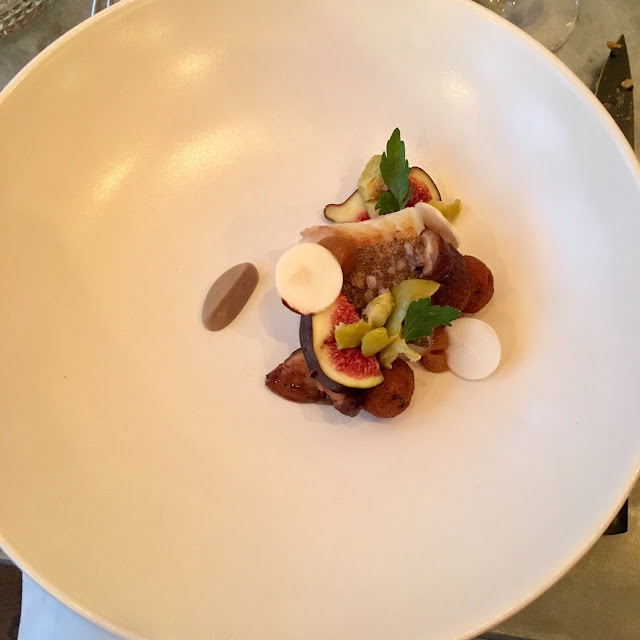 I personally thought the melon with the foie gras did not complement the dish. It didn't bring out the flavor and actually tasted unbalanced. The foie gras itself was good, but a bit too soft to my liking. 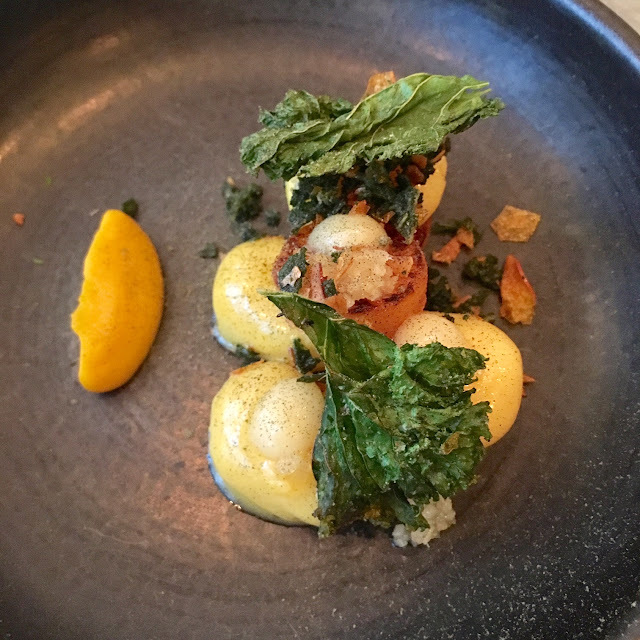 COURSE TWO: GNOCCHI WITH PUMPKIN AND KALE CHIPS. The gnocchi was sweet from the punpkin with a delicate texture. It was almost difficult to find underneath the ingredients piled high. The kale chips were delicious and super crunchy. It was a good dish but my cousin thought it was a bit too sweet for her. COURSE THREE: Pollack with Olive Puree and Fig and Mushroom. The fish was cooked well but was a bit bland. The fig and mushrooms were fresh and the olive puree added a nice touch. The dish included falafel as well, which was definitely interesting. I don't think they balanced well together. COURSE FOUR: DUCK FILET. This dish was quite good and one of the better dishes. 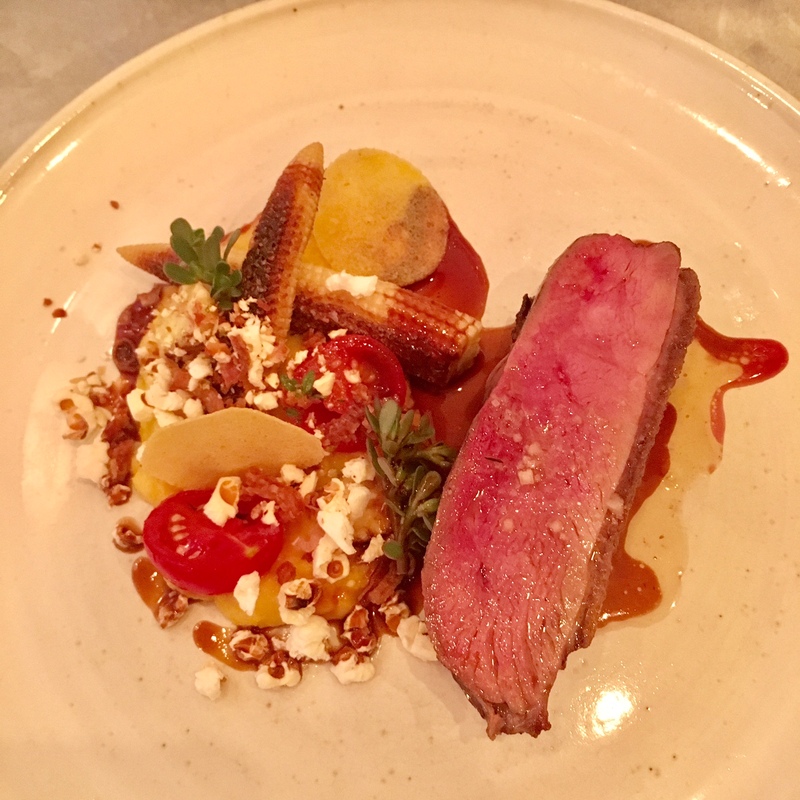 The duck was moist and was complemented by fresh corn and popcorn. Popcorn? Yes, popcorn! Who would've thought it actually would taste well together. The tomato was good as well. COURSE FIVE: Chocolate Sorbet with Coffee Meringue. Parts of this dish was amazing and some parts, not so much. The sorbet was delicious and I almost didn't realize it was a sorbet. The texture was like ice cream. The coffee meringue was delicious. 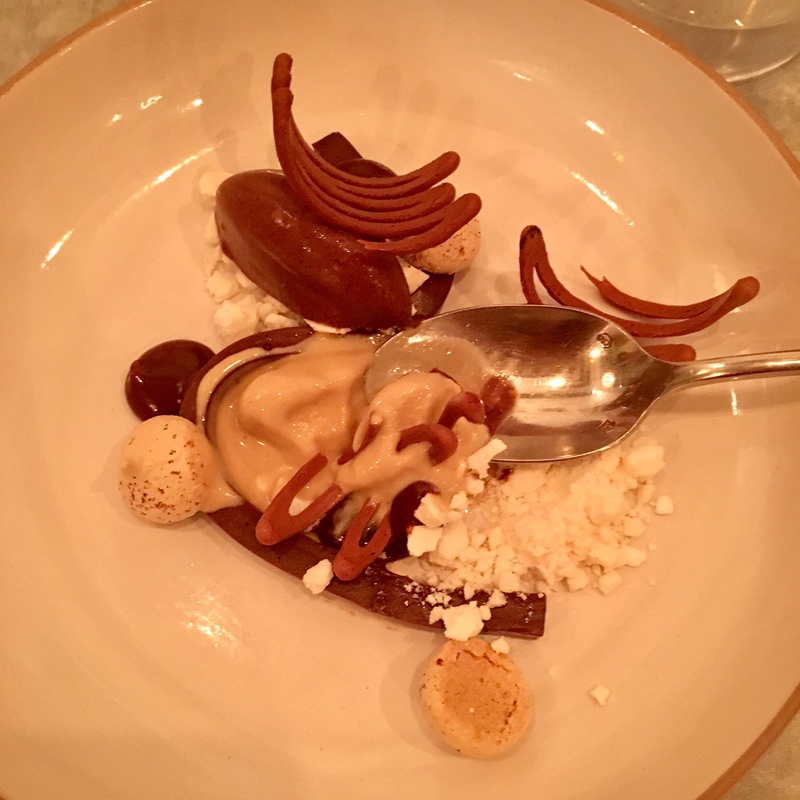 There was this other chocolate concoction on the dish that had an odd texture to it. Overall, it was a successful dish. Overall, Frenchie is pretty solid. I wouldn't say it was the best meal I've had if you're comparing food in France. It probably would be amazing if this restaurant was situated in the States, but you're competing against all these amazing restaurants in Paris. Though the restaurant is in a cute little area in Paris, I almost felt like I was back in LA having been surrounded by everyone American. Nonetheless, the restaurant is pretty popular amongst tourists and the best thing to do is either grab a seat at the Frenchie bar or book a res online months in advance. With a glass of wine and a meal for a party of two, it came out to approximately 200 euros. I guess that's not bad considering that we ate for 2+ hours.